Set off on a family road trip! Perfect for family trips, the caravan holiday home has everything your Sylvanians need for an exciting trip out of the meadow. 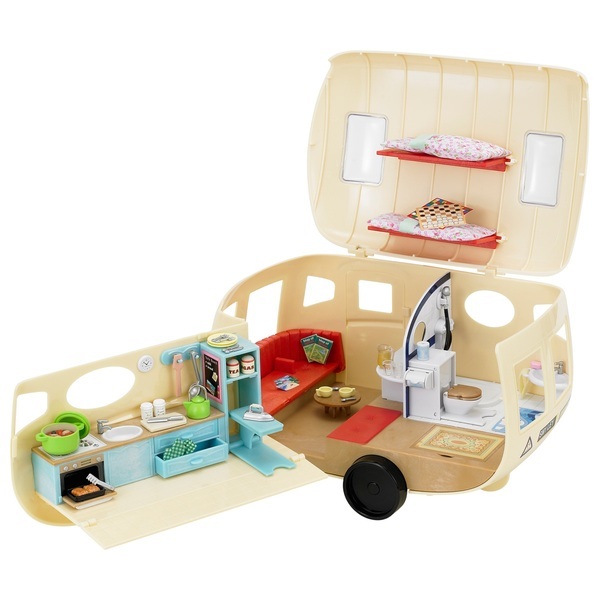 This home- away-from-home comes with all the comforts your Sylvanians might need for a week or so in the wild. Complete with bedding for two, it can cater for a snooze as well as having a well equipped kitchen, seating area and bathroom! There are also 20 kitchen accessories including yummy cakes and biscuits to nibble on, and a kettle for a good old cup of tea. Storage is the secret to any good caravan and this nifty set lets you unfold sections to create additional space. There are board games to keep the little ones occupied, plus maps in case you get lost while trying to find the campsite.